Today, everyone with an interest in contemporary France, and especially in its literary scene, will probably have heard of Didier Daeninckx and be able to recognise him for what he is: a prolific, best-selling author, whose outspoken commitment to a variety of (principally left-wing) causes has constantly led him to “write against,” initially by concentrating on the roman noir, but now also by publishing in prestigious mainstream collections, and by diversifying into a wide range of alternative genres. Yet things could so very easily have turned out differently for him. 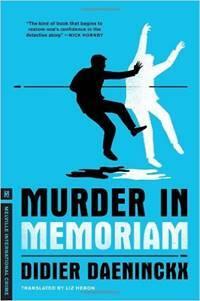 In 1977, he had finished his first novel, Mort au premier tour, and sent the manuscript off to ten publishers. Nine rapidly rejected it, and no response came in from the tenth. Then, unexpectedly, five years later, the missing reply arrived: Le Masque was willing to produce the book. It duly appeared in 1982, but was a complete failure. Daeninckx fully understood why. Having turned to journalism and written numerous articles since his initial knock-backs, he could see that his text was a “disaster.” Unabashed, and knowing that his literary skills had improved considerably in the intervening five years, he persevered, and the rest, as they say, is history. Published in 1983, Daeninckx’s second novel proved to be a prize-winning, runaway success, and it instantly established his reputation and thrust him into the limelight from which he has never since departed. Central to this technique is the device of an investigation, undertaken by an official or unofficial detective. In Meurtres pour mémoire, that character is inspector Cadin. Driven by a strong sense of justice and independently minded, he has “the knack of sticking [his] nose into all sorts of murky areas [… and] stirring things up” (p. 98). Time and again, others will encourage him to be less zealous in his probing, but he will always ignore them. Not seeing things through to the end, whatever the (political and personal) consequences may be, is a concept that is totally alien to him. The specific case to which he commits himself here is the murder of a certain Bernard Thiraud in Toulouse. In the course of his enquiries, he discovers that Bernard’s father, Roger, was also killed, in Paris, twenty-odd years earlier, on 17 October 1961, when a peaceful demonstration against the Algerian War was brutally repressed by the French forces of law and order. It eventually emerges that the two deaths are related, and Cadin finally discovers how. 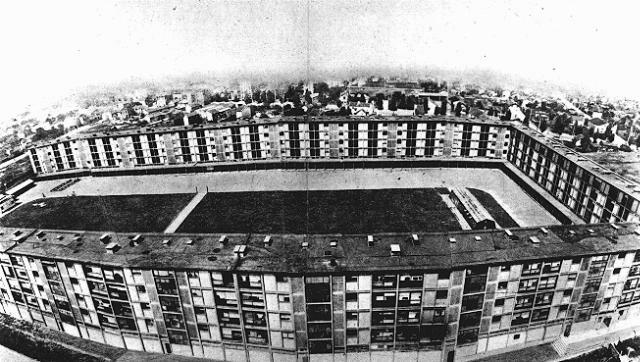 Roger had been researching the camp at Drancy, in the Paris suburbs, where Jews were held during the Occupation before being deported to the death camps, and at two decades’ remove, Bernard had been following in his parent’s footsteps (one of the many reflections and parallels in the novel). This, it transpires, is why father and son were eliminated — to keep such a shameful example of French collaboration with the Nazis secret, perhaps not so much because it relates to a national disgrace (although reasons of State are never far away), as because one powerful man sees his world about to crumble around him. But those who live by the sword die by the sword, and the guilty individual eventually gets his just deserts (generic conventions obligent). This very brief plot summary does not really do justice to the import of Daeninckx’s text, which, as noted above, goes way beyond the simple detective story to highlight a whole host of inconvenient (historical) truths. Cadin is not just a policeman, but also a metaphorical historian or archaeologist, delving into a “lost” past in order to bring it back into the present. Out of the darkness he extracts light, his widest-ranging discovery being that authorities of all kinds are engaged in sanitising History for their own particular ends. The police and politicians are found to give false accounts of events (pp. 80, 93, 213); the security services and diplomats help to bury unsavoury facts (pp. 99-100, 103); archives are closed, and documents seized or mothballed (pp. 74, 84, 87, 99, 152); investigations are not properly conducted (p. 81, 99); amnesties make further scrutiny impossible (p. 168); and so on and so forth. In a word, “Governments have no interest at all in seeing certain ghosts come back to life,” (p. 82) and so the consensus becomes that “it’s time to forget” (p. 82). Cadin, however, irrevocably unconventional and out of place (as his role as detective traditionally demands), steadfastly swims against this powerful tide, and as a result becomes an agent of memory. Hand in hand with his investigation of Bernard’s murder (and then Roger’s) goes a deconstruction of prevailing historical narratives, and the establishment of counter-histories. Unsettling reminders of the past include the wartime Vichy government’s sentencing de Gaulle to death for high treason (pp. 42, 62); the use of torture and State assassination squads during the Algerian War (pp. 74-75, 94, 148, 153-56), and the realities of working-class life that both “legend and literature have neglected” (p. 133). 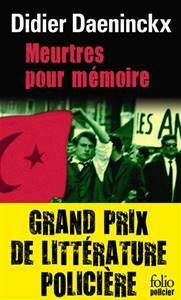 Yet despite this steady drip-feeding of unorthodox and disturbing facts, the main heretical impact of Meurtres pour mémoire can be ascribed to its lengthier focus on two officially overlooked (remember, the book came out in the early 1980s) historical phenomena in particular: the repression of the pro-Algeria marches on 17 October 1961, and the existence of the wartime camp for Jews at Drancy. The 1961 demonstration is where the novel actually begins, and in the initial depiction of events, as in their reconstruction from Cadin’s enquiries, Daeninckx is anything but conventional. He shows how peaceful protesters are savagely set upon by the special policemen of the CRS, some of whom see themselves as hunters and their victims as their kills (p. 92). Victims and kills are the operative words, for the marches descend into carnage. 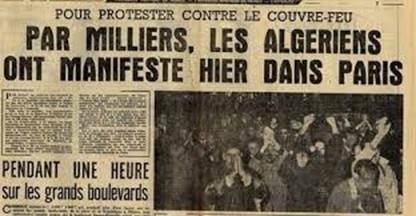 There is mention of “Algerians impaled on the railings of the elevated métro, and rapes in police stations,” (pp. 86-87) but the largest atrocity takes place in the Préfecture of Police, where the tally is “forty-eight dead bodies […]. Not one of them had been shot. The post-mortem assessment was the same for all of them: beaten to death with truncheons. […] Every police officer […] was told to attack the prisoners. Result, 48:0. An impressive score […], although this never happened officially. There is no proof. No trace of these forty-eight bodies […]. Everything was consigned to the vaults of History and forgotten.” (p. 97)  One native Frenchman who witnesses the brutality tries to help an injured Algerian — only to be badly beaten by the CRS (p. 35) — but most prove completely indifferent, or voice their support for the police, or actively help the forces of law and order (pp. 28, 32-35, 93). 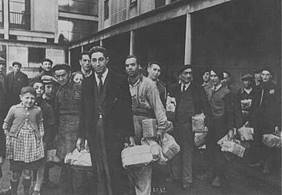 On 20 August 1941, the flats of La Muette in Drancy were officially transformed into a concentration camp to hold French Jews prior to their deportation to Germany and occupied Poland. Roger Thiraud quoted the figure of 76,000 people, including women, children and the elderly, who were rounded up over three years within a few kilometres of the Place de la Concorde, and then deported to Auschwitz. He put the number of those who came back at less than 2,000. Equally shocking for Cadin, as he pores over Roger’s research, is the realisation that, for the civil servants involved, deporting Jews was just one of their administrative tasks, and was carried out dispassionately, with the aim of making the procedure as efficient as possible (p. 188). It is, in fact, because of extant Occupation administrative documents which he reads in Roger’s manuscript, that Cadin eventually sees the links between the wartime deportations and the repression of 17 October 1961. Indeed, to the perhaps better-informed readers of today, such links will already have been inferred from the way in which the French police (and CRS) deal with the pro-Algeria marchers. 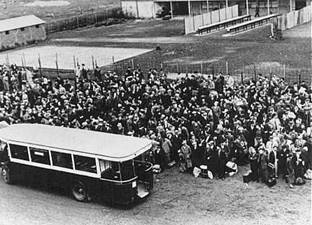 They arrest “hundreds” of them, pack them into buses from the RATP Parisian transport company (p. 35), and send them to a big Exhibition Centre, where they are held (p. 96). Then, as if these parallels with the Occupation were not clear enough, one night, as Cadin sleeps, his mind relives his investigation as a nightmare, in which Algerians have replaced the Jews in the railway cattle trucks (pp. 180-82). Yet despite all of this, Daeninckx, as he regularly stresses, is not a historian. He is a novelist, and as such he is able to deploy a host of literary devices to reinforce his central points, and make them broader based and more subtly compelling. A whole raft of apparently minor details thus take on secondary, more allusive meanings, as the following examples will serve to demonstrate. 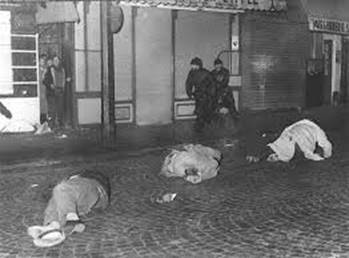 When the CRS violently attack the Algerian demonstrators, the play on the bill of the nearby theatre is Goodbye Prudence. A jewel thief who swallows his haul is given a laxative, which is symbolic of the foul, stinking (yet precious) historical details that are being brought back into the open, while the gravediggers’ strike leads to a “stench of decaying carcasses” (p. 59) evocative of an unwholesome past rotting on in the present. Roger and Bernard Thiraud, thanks to their research, are personifications of the disturbing counter-narrative that the State feels the need to suppress; Bernard additionally embodies his generation’s desire for its true, historical inheritance; and Mme Thiraud, who cloisters herself in her flat, shows how the past can have a negative impact on the present, until Cadin, in his role as informal therapist, releases her from her trauma (pp. 39, 52, 116-18, 122). The most striking image of all, however, is the famous one with which the novel ends. At the Bonne-Nouvelle metro station (linked to the police brutality in 1961), an Algerian worker scrapes away posters which, for decades, have been pasted one on top of the other, and he eventually uncovers fragments of a German text associated with the persecution of Jews. This particularly rich metaphor acts as a perfect conclusion to a number of the key strands in the novel: it links antisemitism with the (racist) treatment of North Africans; it intimates that, as with the motive for Bernard’s murder, beneath the 1960s lie the dark years of the early 1940s, and it embodies the notion of History as a palimpsest, where previous events underpin, feed into and influence those of later periods, at the very same time as they are deliberately hidden from view and overwritten. As may by now be obvious, Meurtres pour mémoire should appeal to anyone, at all levels, with an established interest in History. The novel indirectly illustrates the methodology of the historian, who, like the detective, is a searcher after truth, focusing on traces and fragments, journeying through time and memory to counter oblivion and reconstruct events. Daeninckx also warns that so-called “objective History” is often made up of falsehoods, and compromised by the “hushing up” of inconvenient facts; that a lack of openness regarding contentious events can have dire consequences for later generations and for nations themselves; and that racism, persecutions and, indeed, State crimes, are recurrent dangers that need to be combated. Add the massive “historical” relevance of outing Papon, of stressing the links between French collaboration in the Holocaust and the massacre of Algerians to the attraction and accessibility of the detective-genre format, then mix in the book’s eloquent metaphors and symbols, and Meurtres pour mémoire should prove to be an ideal text for use the classroom. In conclusion, there is one final reason why this novel is worth studying. Daeninckx’s quest for the “real facts”, fuelled by the concomitant belief that societies cannot live healthily if they are not honest with themselves is, as Claire Gorrara has noted, a decidedly ethical enterprise. At a time when more and more of us find ourselves locked into a (political) landscape that is deemed to be “post-truth”, Meurtres pour mémoire may serve as a cautionary tale for some, and a beacon of light for us all. Didier Daeninckx, Meurtres pour mémoire (Paris: Gallimard, 1983); Murder in Memoriam, translated by Liz Heron (London: Serpent’s Tail, 2005), (Brooklyn, NY: Melville House, 2012). See e. g. Didier Daeninckx, Écrire en contre (Vénissieux: Paroles d’aube, 1997), pp. 68, 97. Ecrire en contre, pp. 53, 78-79. Here and throughout this review, all translations from the original French are my own. Daeninckx has never allowed his problematic first novel to be republished. The work entitled Mort au premier tour that is currently available is a completely rewritten version that first appeared much later (Paris: Denoël, 1997). Didier Daeninckx, Meurtres pour mémoire (Paris: Gallimard, 1983). All page references in this review will be to the 1998 Gallimard Folio policier edition. Thierry Maricourt, Daeninckx par Daeninckx (Paris: le Cherche Midi, 2009), p. 268. Didier Daeninckx, La Mémoire longue (Paris: le Cherche Midi, 2008), p. 265. See Meurtres pour mémoire, p. 166, and Ecrire en contre, p. 121. In interview, Daeninkcx has been even more specific: “The police […] killed between two hundred and three hundred protesters, in the most horrible ways imaginable. Drowning, beating with truncheons, hanging, machine-gunning, summary execution, finishing off the injured…” (Ecrire en contre, p. 121). See e. g. Maricourt, pp. 117, 130, 219, 267, 276. La Mémoire longue, p. 264. Note also that Veillut’s accomplice is called Lécussan. During the Occupation, a certain Joseph Lécussan was head of the General Commissariat for Jewish Questions in Toulouse (the city where Daeninckx’s character works) and a leading figure in the provincial Militia. He was executed for his crimes in 1946. Ecrire en contre, p. 144. See e. g. La Mémoire longue, pp. 263-64. Claire Gorrara, ‘Meurtres pour mémoire: Remembering the Occupation in the Detective Fiction of Didier Daeninckx’, Journal of the Institute of Romance Studies, VI (1998), pp. 353-59 (p. 358).